Following weeks of wet weather it was good to see a little sunshine at Enstone and make a little more progress with the top trench. 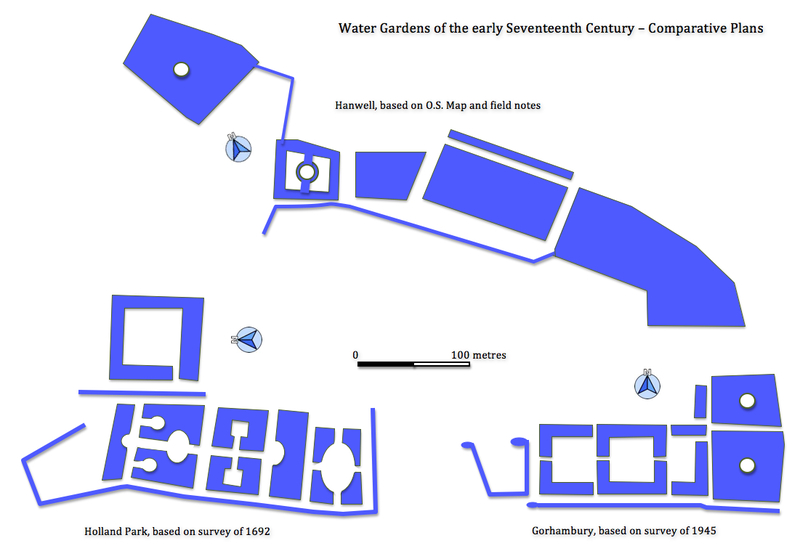 The aim was to see how the wall was constructed and how it related to the surfaces associated with the seventeenth century garden and presumably a walkway above. 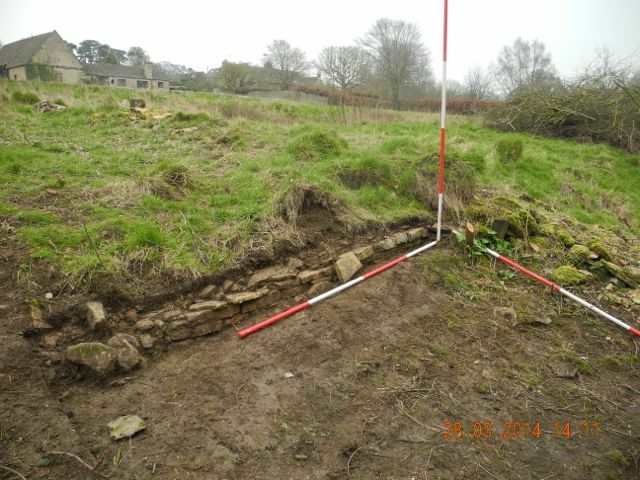 The main trench in the middle of the top terrace is being left until conditions are perfect! As far as we can see this wall stands pretty well to full height fossilized within the walls of the three-sided structure to the north. Peter and Robin carry on exploring the wall, view looking north west. The lower section of earlier walling stands out clearly, view looking north east. 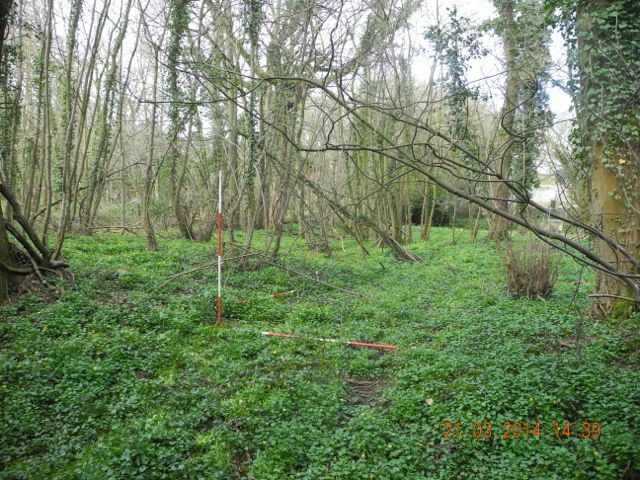 Meanwhile back at Hanwell the race was on to complete the survey of what we have come to call the moated area before the undergrowth became too troublesome. Perhaps hardest of all was to work out the position of the new drawing against the fixed points put in last year. 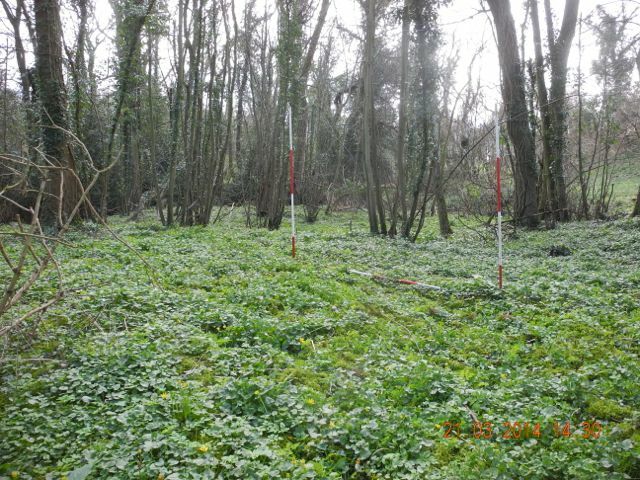 The theodolite was invaluable once I had worked out it was a bad idea to set it up pointing towards the sun, the glare from the shiny surfaces of a multitude of ivy leaves made it impossible to get decent readings. For the trickier parts of planning: the initial setting out and then measuring across the streams, we had three person teams operating so special thanks to Peter, Chris and Mike for wrestling with tape measures. Central declivity, view of 3, looking north. The Lady Pool, view of 4, looking north-east. 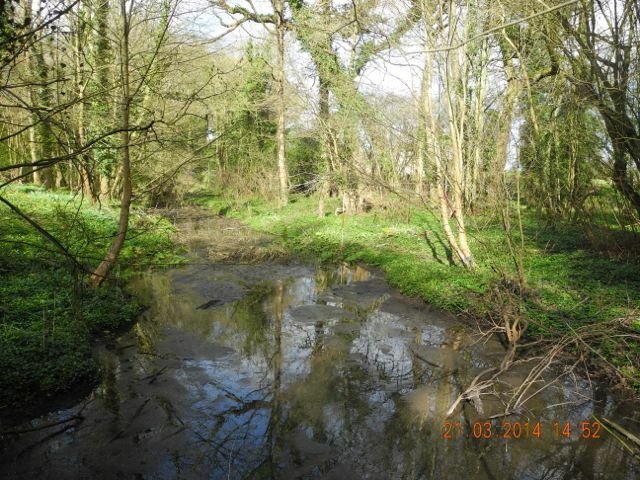 One of the key early realizations was that this feature mapped originally as a fishpond could be no such thing. It was clear that there were areas within the 'fishpond' that stood as high as the dam to the east and so would always have been above water. 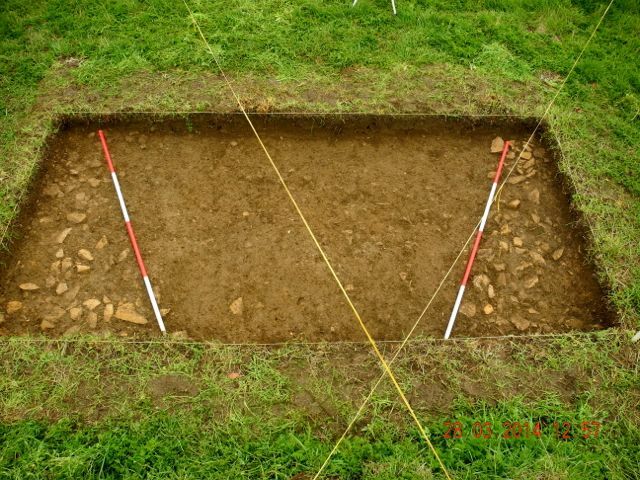 What became evident as we went over this feature on the ground was that there were structures within the raised area, this was more than a simple rectangular moated enclosure. The current understanding is that we have a low central mound flanked by two shallow channels running in towards it from the peripheral moat. 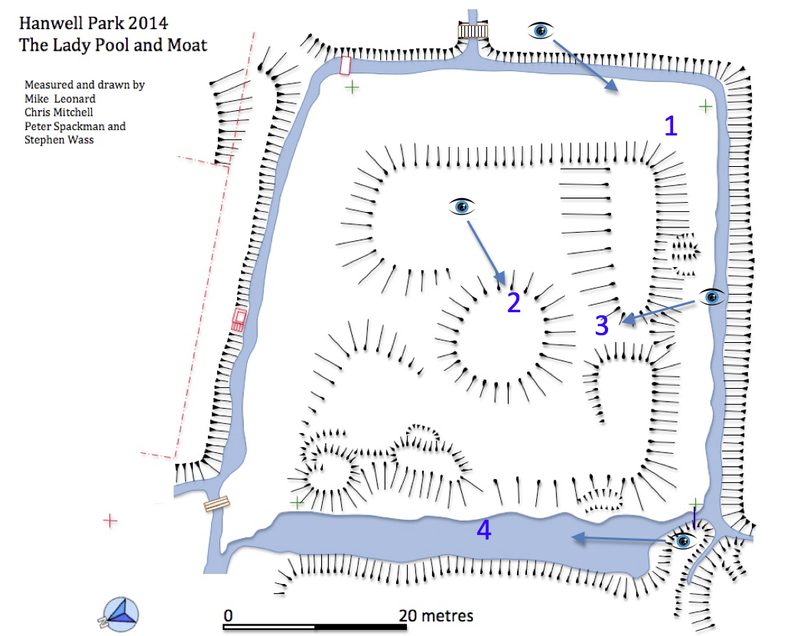 Whilst the whole area has been badly disturbed; the mounds towards the north corner are spoil heaps containing material dredged from the Lady Pool and much of the interior is covered by a curious kind of miniature ridge and furrow which is awaiting further study, the overall shape is strongly reminiscent of some of the decorative arrangements of moats, channels and islands seen at Gorhambury and Holland Park. I've taken the liberty of inserting a possible reconstruction of the arrangement in the comparative plans below. We didn't entirely neglect the digging at Hanwell. 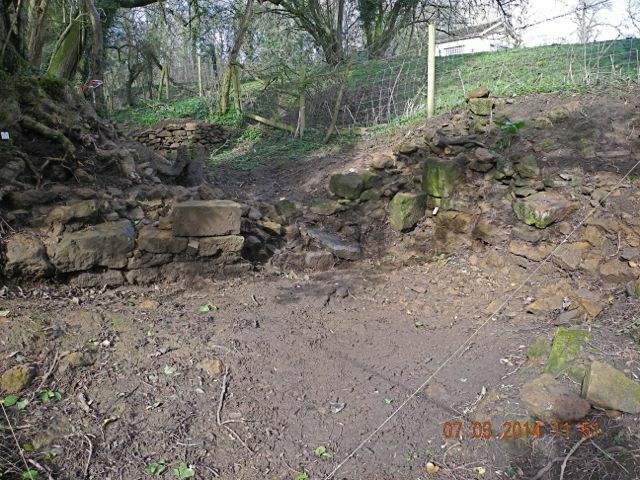 There is a bit of a rush on to complete the interim report on the excavation of the Cascade from last year - which is now being progressively back-filled. 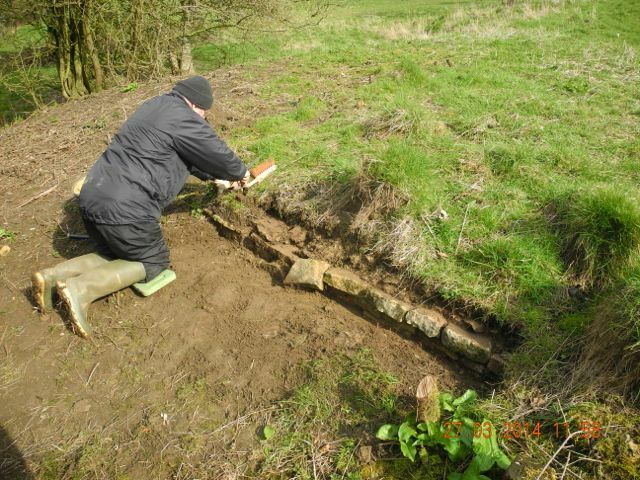 The final piece of investigation was to take a further look at the lower courses of stonework on the 'upstream' side. 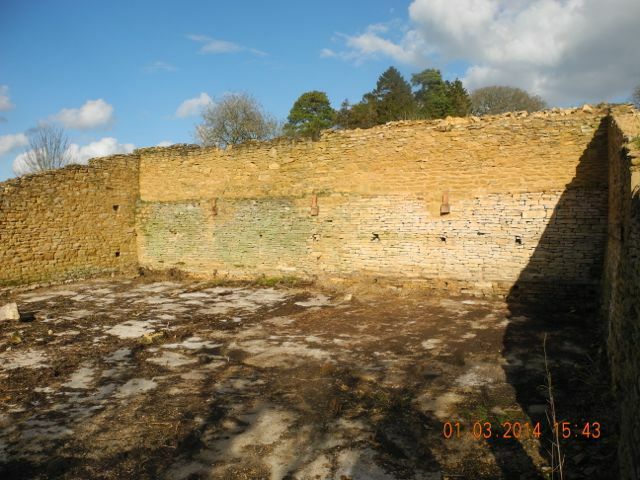 It was felt that the wall was too fragile to excavate to a greater depth along its whole length but the piece that was uncovered was unusually well built. 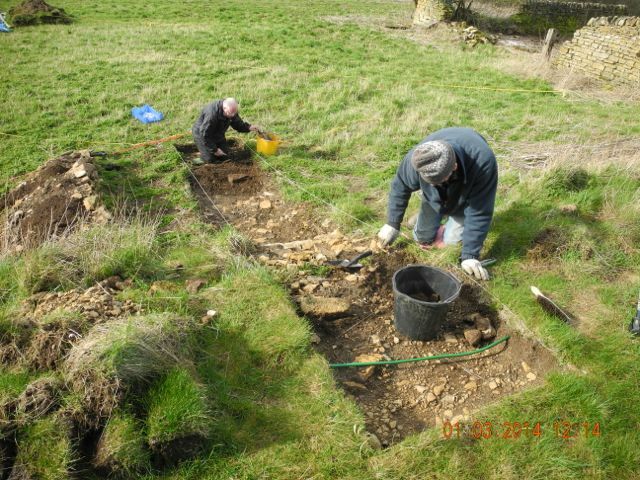 We also spent more time cleaning up last year's dig around the second sluice so it is all ready for further excavation as the weather improves. The other Peter stands next to the newly dug section with our trusty corer in hand. Getting spick and span (where does that come from?) down on the second sluice. We managed to fit in a couple more sessions at Enstone before the end of the month. Up on the top terrace the plan was drawn of the latest layers in the trench against the top terrace wall (ENA 14 B) and we finally got sorted with cleaning up the main area of excavation on the top terrace (ENA 14 A) which had been covered over since November. It was extraordinary how much new soil had accumulated under the tarpaulin thanks to earthworm action. Anyway once cleaned it was photographed and a start made on planning. Down at the end of the 'alley' Peter did some more work to define the walling (ENA 14 C)which seems to mark the end of the walkway and Nick and his dad cleared some more blackthorn. 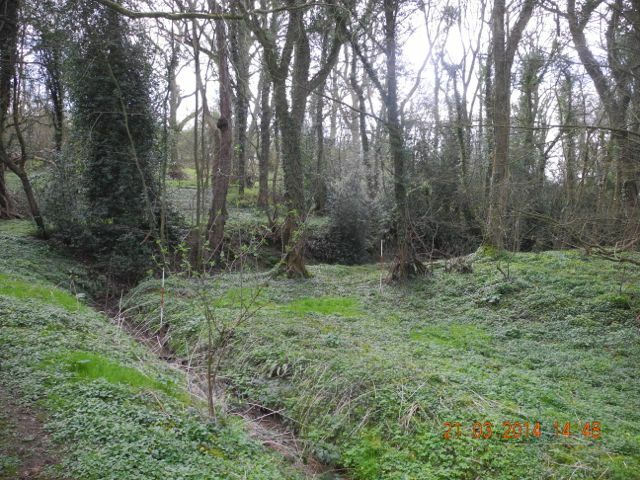 Concerned that the onset of spring would soon obscure further features underneath growing vegetation Nick lead an expedition to explore a narrow section of his land hitherto fenced off by barbed wire. 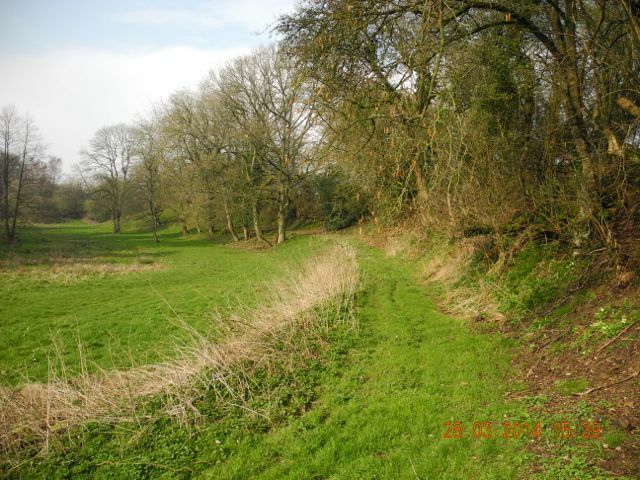 once this was snipped through we were able to explore a terraced way which seemed to mark the limit of the pleasure garden whilst at the same time providing access up and down the valley. it would have been a lovely stroll. Peter starts to clear along the line of the new wall revealed at the end of the 'alley'. 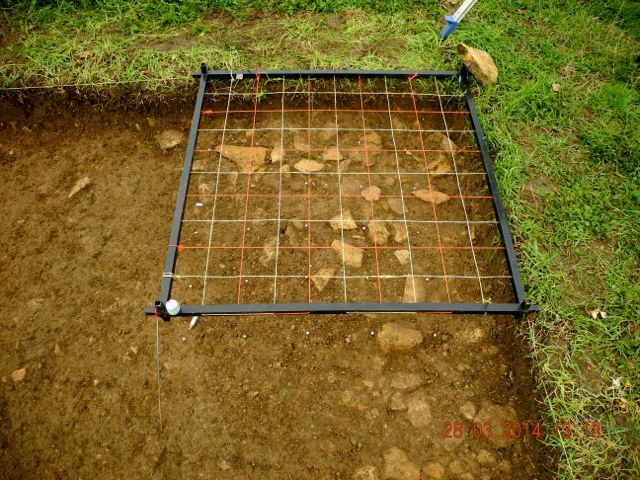 The newly cleaned trench on the top terrace, then we used a drawing frame and plumb bob to project 20 cm squares onto the ground surface as an aid to drawing. 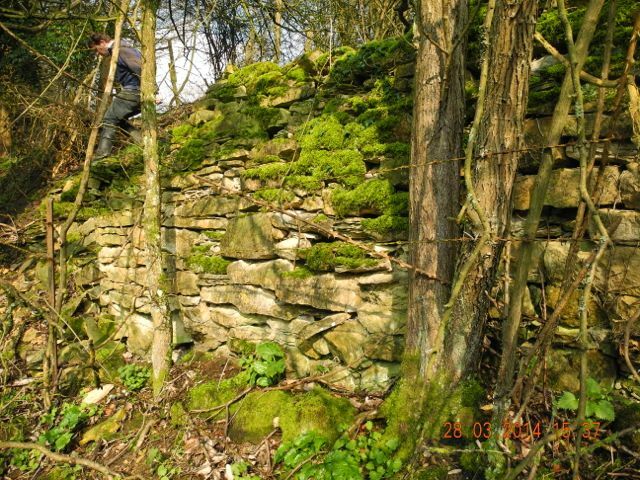 Further explorations: a surviving fragment of the perimeter wall west of the garden and looking north up the valley along the line of a terraced walk or driveway.